Beautiful baju kurung Islamic costume with tudung or hijab, a traditional costume worn by Muslim as well as non-Muslim women in Malaysian, Indonesia, Singapore and Brunei, the ideal modest look - comfortable but pretty. 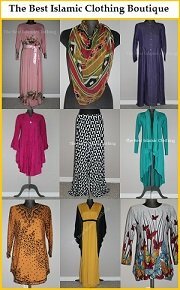 If you are in Malaysia, Indonesia, Singapore or Brunei, you are bound to notice many women dressed in a long tunic, paired with matching sarong and a lot of time complete with gorgeous style of tudung or hijab. This is the baju kurung, traditional costume of the Malay women that blends seamlessly with the multi-racial population of the countries. Baju kurung is a traditional outfit comprising a loose-fitting blouse and a sarong. 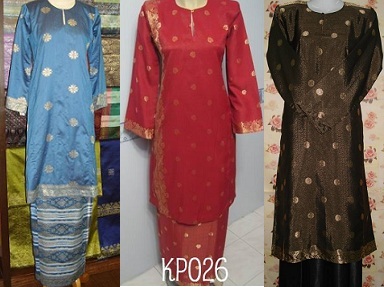 The top of the baju kurung is similar to the style of kameez or kurta or long tunic. A traditional sarong is a long straight skirt with folds on either the right or the left side of the sarong. The costume is both aesthetically pleasing and complied with Islamic tradition, covering all of the body except for the hands and feet. The attire also comes with embroidery on the sleeves, hem and neckline, which is completely suitable for formal wear. The term baju kurung comes from a Malay language which can be translated loosely into 'confined dress'. The style in baju kurung is very simple- a loose blouse with rounded neckline and a slit in front that held together with a single button or brooch. Both men and women can wear the outfit, but the men wear the blouse with pants along with a shorter version of the sarong folded around the hips called kain samping. Baju kurung is made of a range of fabrics, but light cottons and polyester remain the most popular for everyday use. These materials are suitable in these tropical countries. More luxurious fabrics such as songket (traditional gold or silver embroidered material), silks, brocades, organza and lace are reserved for special occasions such as Eid, wedding or formal events. The contemporary baju kurung is a highly versatile costume, worn by almost every woman in these South-East Asia countries, from school children to government servants, corporate figures and royal families. It is an outfit that blend effortlessly in these multi-cultural countries. It is not uncommon to see non-Muslim and other races in these countries dressed up in baju kurung as its fluid lines offer easy movement and a refreshing alternative to the less comfortable and breathy attire in these warm countries. The traditional and modern baju kurung is a must for Muslim women and sometimes for non-Muslim as well celebrating Eid and Muslim wedding. This traditional and Islamic clothing reflects the grace of the Malay woman which has withstood the test of time over the centuries. 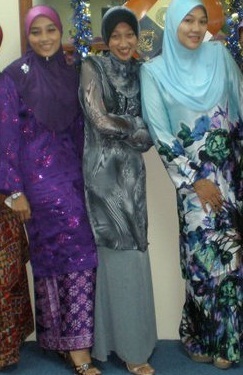 Traditional baju kurung, a straight cut pattern, though loose in style, it should not be baggy. The ideal measurement should be the width of the shoulder is the exact measurement of your shoulder or else the shoulder pad will slip sideway, adding pound to your appearance. The hip should be around 4 inches extra of your hip measurement. For chiffon material, the current popular choice for baju kurung, or other very soft fabric, allow a little bit more than 4 inches for lining or inner outfit, as well as for better flow and fall of the costume. If done correctly, chiffon not only produces effortlessly sophisticated baju kurung but can also give slimming silhouette effect to the wearer. For round figure, avoid frills and large sleeves style, even though they are in fashion, they are not complimentary to your body. Modern baju kurung, long tunic top style, with slightly heavy but flowy material will suit this body frame. Large prints baju kurung suits the petite and slender body, while small prints are absolutely perfect for big figure. General rule on colours in clothe also applies for baju kurung. Lighter colour baju kurung compliment the small figure, while dark colours will suit heavy frame. For the hijabi, patterned or printed tudung or hijab suit solid colour baju kurung, the same way plain colour tudung matches printed baju kurung. Wear tudung that matches baju kurung in term of colour and material for impeccably smart look. If you are wearing printed baju kurung, to soften the look, wear plain tudung from any colour of the prints of the baju kurung, rather than the background colour of baju kurung. Bold prints baju kurung will date quicker than plain, classic ones, so fill your wardrobe with fuss-free baju kurung. Stripes baju kurung is not uncommon. Wear stripes to flatter your shape, horizontal to add curves or vertical to slim. For ultra-modern and elegant look, dress head-to-toe in one colour baju kurung of luxurious material such silk or satin and add contemporary accessories.